While Aston Martin is the marque most closely associated with James Bond, the literary character is very much a Bentley man. From the word go in Casino Royale Bond is driving one, and while he is to be found behind the wheel of a secret service Aston Martin in Goldfinger, Bond’s personal car is always a Bentley in Ian Fleming’s books. Bond’s first Bentley is a 4½-litre Convertible coupé in battleship grey with an Amherst Villiers supercharger. This particular model was known as the “blower”, developed specifically for racing. 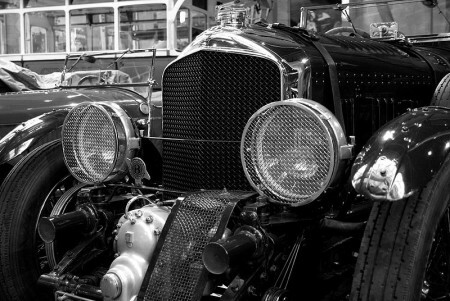 With a huge supercharger mounted on its nose and large French Marchal headlamps it certainly was distinctive looking, although rather unsuccessful as a racer. According to Casino Royale, Bond bought the car in 1933 and had kept it in storage during the war. However, in You Only Live Twice – published eleven years after Casino Royale in 1964 – we learn that he joined the armed forces in 1941, when he was 17. How he owned his first car at nine remains one of the great mysteries of the series. Although the car sustained serious damage in Casino Royale, repairs were made in time for Moonraker. However, the car was once again damaged, this time beyond repair and Bond must have cursed his luck as only 54 blowers were ever made. At the end of the book though he buys a second Bentley, a 1953 Mark VI with an open touring body. Bond agrees to buy the car after a test drive on condition that it is at the Calais ferry terminal the following evening; Fleming never referred to the Mark VI again and it too must remain a mystery. In Thunderball Bond is once again behind the wheel of a Bentley, having bought a wrecked Mark II Continental with the R-Type chassis. Its previous owner had written it off after driving into a telegraph pole, so Bond had the chassis straightened and upgraded the engine to the Mark IV. Bond also commissioned Mulliners to remove the original sports saloon body and transform the car into a rather square two-seater convertible; in those days it was common to commission coachbuilders such as Mulliners to design and build car bodies and like his two previous Bentleys the car is painted battleship grey. Bond’s customisation doesn’t end there though, as the car is fitted with two-inch exhaust pipes and a big octagonal silver bolt in place of the Bentley winged B.
Fleming wrote to Rolls Royce in 1957 asking for information on a hybrid somewhere between a Bentley Continental and the Ford Thunderbird – Fleming owned two Thunderbirds in succession – and was directed to Mulliners, who had been commissioned for a similar project. The Mulliners design proved too expensive and so the Portuguese owner chose Henri Capron to build the car in France instead, but the result seems closer to Fleming’s request than the Mulliners design, with a long Thunderbird-like boot. Back in the same Bentley at the start of On Her Majesty’s Secret Service we learn of Bond’s latest modification to the car, an Arnott supercharger controlled by a magnetic clutch. Rolls Royce advised Bond that the crankshaft bearings wouldn’t cope with the additional strain but all the same he gets the chance to flip the red switch on the dashboard to activate the supercharger while racing a certain Contessa Teresa di Vicenzo on the road to Royale-les-Eaux. When not in his own car, 007 is sometimes reduced to borrowing or renting his transport, including the Aston Martin provided to him by his employer in Goldfinger when he tails Goldfinger’s Rolls Royce from Kent, across the English Channel and through France into Switzerland. The Aston Martin is fitted with a number of extras by Q branch, although nothing like the ejector seat fitted to the DB5 in the film. Described as a battleship grey DB III, it is more correctly an Aston Martin DB Mark III – the third incarnation of the DB 2/4 which had a new front grill based on that of the DB3S racing car. 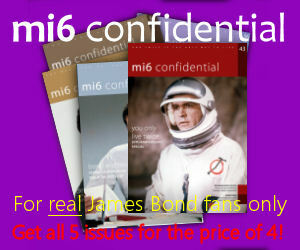 But for all the association we have for James Bond and Aston Martin, the car fails to reappear in the books. While James Bond drives his Bentley in England and continental Europe, or an Aston Martin provided by the British Secret Service as in Goldfinger, there are occasions when he is forced to borrow or rent transport. When he arrives in Jamaica in Live And Let Die, for instance, he drives an unspecified small car brought up from Kingston by Quarrel, a Cayman islander who assists him on his mission. 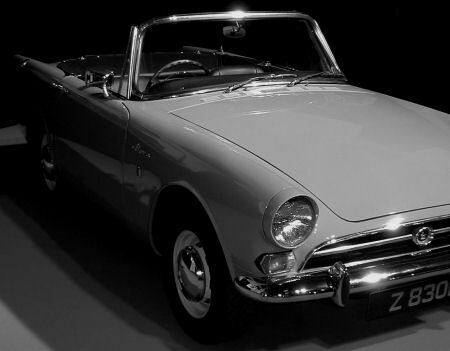 In Dr No, again accompanied by Quarrel, he drives the black Sunbeam Alpine belonging to Commander Strangways, whose disappearance Bond is sent to investigate, which also appears in The Man With The Golden Gun. 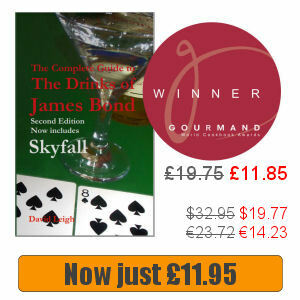 And in the short story From A View To A Kill he borrows a battered black Peugeot 403, as well as making a brief appearance on the two wheels of a Royal Corps of Signals BSA; in Thunderball he and Leiter borrow the Governor’s Humber Snipe, while Bond meets Domino in a borrowed Land Rover. Crossing the Atlantic, Bond pours scorn on American cars whenever the opportunity arises. In The Living Daylights he compares drab West Berlin’s glossy veneer with the chrome trim on American cars and although he appears impressed when Felix Leiter drives an old Cord in Live And Let Die; Bond considers it has personality compared with other American cars – he is quick to point out the faults of Leiter’s car in <em “>Diamonds Are Forever. However, this is short-lived – when Leiter floors the throttle of his “Studillac” Bond is stunned by the acceleration. Although the Studillac sounds like pure fantasy, Fleming had come across a similar car owned by William Woodward Jr, who he met while staying with mutual friend Ivar Bryce on a research trip for Diamonds Are Forever. The Studillac was the product of renowned French designer Raymond Loewy, who was also responsible for such icons as the packaging of Lucky Strike cigarettes, the Greyhound bus and the Shell logo. The car consisted of a Studebaker with modified suspension and a powerful Cadillac engine. According to Andrew Lycett’s biography, Fleming was pulled over by the local sheriff while test-driving Woodward’s car; he was let off when the sheriff could barely understand his upper-crust English accent. Ian Fleming’s whole attitude to American cars was very different to that of his creation and when he received £6,000 for the film rights to Casino Royale, Fleming immediately bought a Ford Thunderbird. He loved the car so much that he bought another to replace it a few years later and appears to have been so obsessed by it that that his wife even nicknamed Fleming “Thunderbird”. Bond drives a hired Thunderbird in The Spy Who Loved Me – actually the only reason that he is involved in the story is because of a puncture; and it is surely no coincidence that Fleming named the hotel in The Man With The Golden Gun after the car. After a successful two year run at the National Motor Museum at Beaulieu March saw the “Bond In Motion” exhibition move to the London Film Museum at Covent Garden. Recently I was looking for information on 007’s cars from John Gardner’s books and was surprised to find that a definitive list doesn’t appear to exist. The main cars featuring in the James Bond films, including Aston Martins, BMWs, a 2CV and many more. When James Bond drove a Lotus Esprit S1 directly into the water on the Sardinian coast to escape a helicopter in hot pursuit in The Spy Who Loved Me (1977), he introduced what is one of 007’s best-known gadgets; flipping a switch the car turns into a submarine. The James Bond Aston Martin DB5 displayed at a car show Few cars get close to the style and class of an Aston Martin, but thanks to its appearance in Goldfinger the DB5 has been elevated to mythical status. 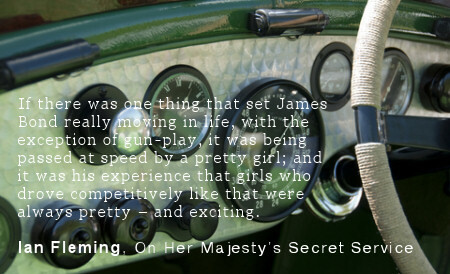 Although the film series has inextricably linked 007 with Aston Martin, in Ian Fleming’s books James Bond’s personal car was always a Bentley, one of three mentioned in the book series. The Aston Martin V8 Volante from The Living Daylights was one of the big draws to the Barcelona Classic Car Show last weekend.